Serve up some vintage charm with this lovely Mason Jar Mug that can be personalized with up to four lines of custom text (for a small additional charge). 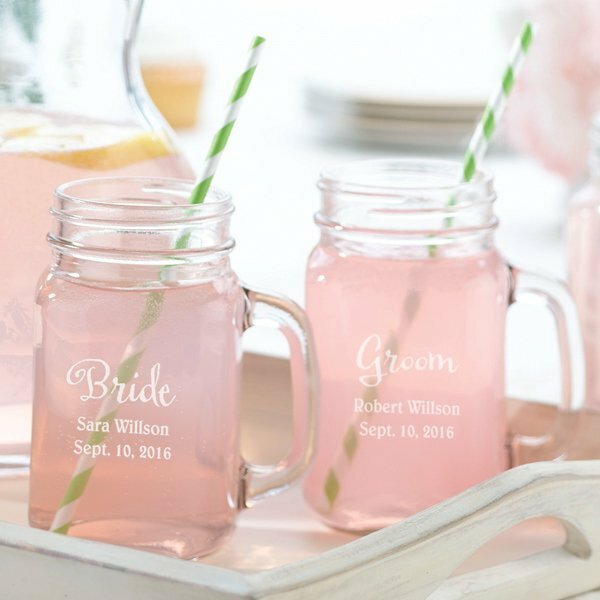 These mason jars make great bridal party gifts so buy one for all of the groomsmen, bridesmaids, ring bearer, flower girl, etc. The mug holds 16 oz and stands 5 inches tall. And don't forget to add some of our striped paper straws too!NOTE - not intended for hot use or canning. Will i be able to see a preview before ordering? 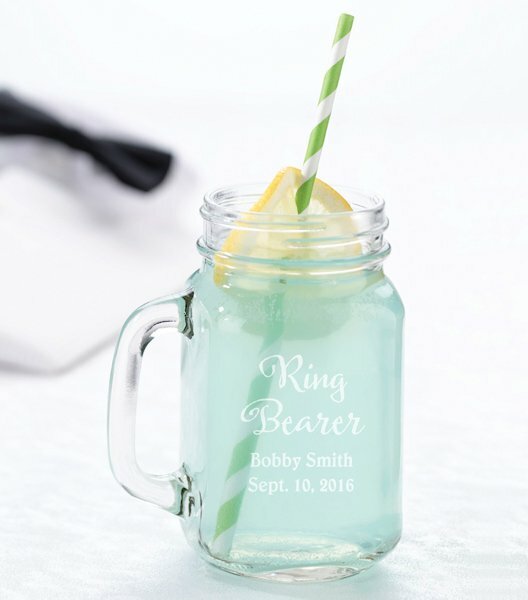 I'm sorry , there is not a preview tool available for these Personalized Wedding Party Mason Jar Mugs. I would love to order a few items from you guys and saw that you will beat any price by $10. I found the same personalized 16 oz mason jar glasses on another site for $1.69 each plus a flat $35 setup fee. (favorsltd.com) Let me know if you'll match that and I'll order asap. Thanks! Yes, we price match. You can find the information to do so by clicking here. 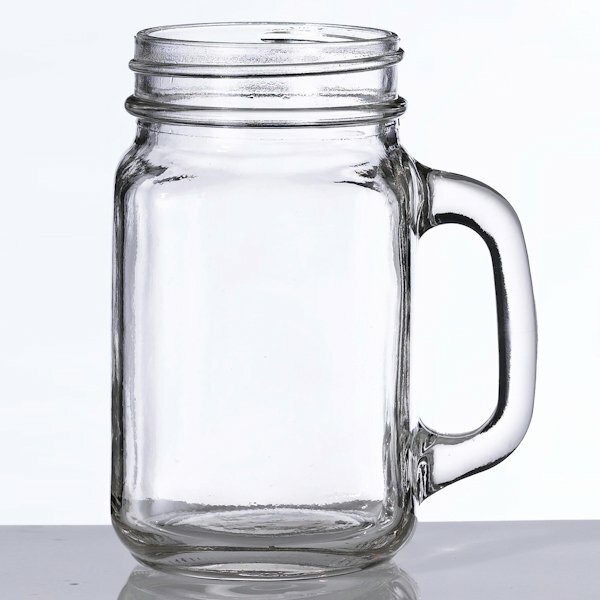 There is an easy form on that page to use under "Request a Price Match"
Hi, I'm curious about the mason jars-- only one has a straw. 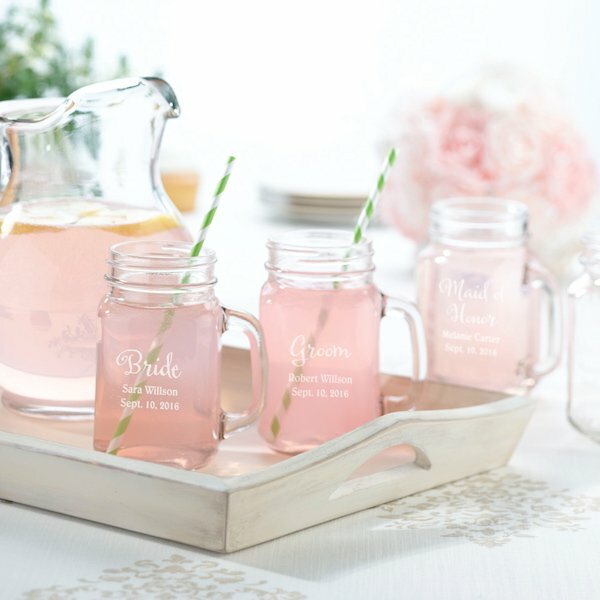 Is it possible to order some jars with straws and not others to set at guests' seats for their parting gift? The straw is for decorative purposes and must be ordered separately. You can find the straws here. These mason jars are made to be drinkable. We’ll send you whatever design is shown on the picture. Some have different tops than others. Those are not interchangable. You’ll only get what you see. Hi, I was wondering if you guys can engrave my contact info on the bottom of a glass? 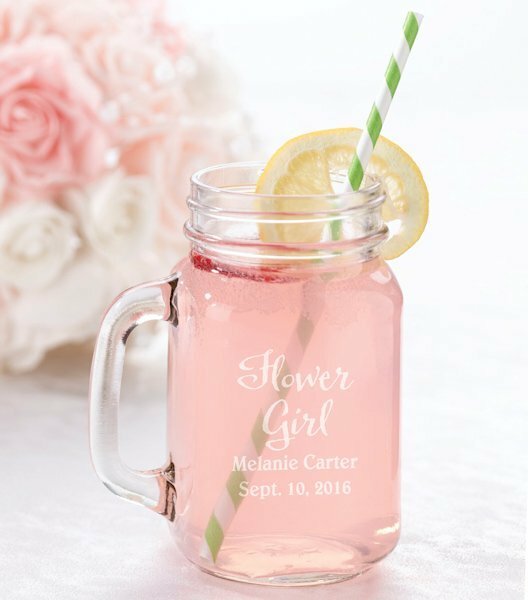 Unfortunately, we don't have an engraving option available for this Personalized Wedding Party Mason Jar Mugs. We can only print a text on the jar with a maximum of 14 characters.